…and you can’t beat Forty-20! 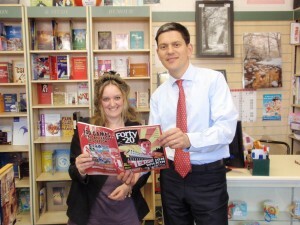 Look who popped into Philip Howard Books, Roundhay, Leeds – home of Scratching Shed Publishing Ltd – today! That’s right it’s David Milliband, future Prime Minister (he just doesn’t know it yet) and brother of current Labour leader Ed Milliband. While he was in the shop, our own dear Ros Caplan couldn’t resist showing him a copy of the independent voice of rugby league. Welcome aboard, David!